A brilliant fuschia plant in a hanging basket is the delight of many gardeners. Although fuschias, with their delicate hanging blossoms, may seem intimidating to some due to their unusual beauty, they have only basic needs and will thrive with standard gardening care. Select a growing spot carefully for your fuschia hanging basket and you will enjoy the fuschia plant’s continuous blossoms throughout the growing season. Hang the fuschia in a growing location with partial sun exposure. Morning sun, mid-day shade and late afternoon sun is an ideal sun exposure for fuschia plants. Fuschia plants do not tolerate mid-day sun and heat and the plant will likely suffer if it receives too much heat and sun. 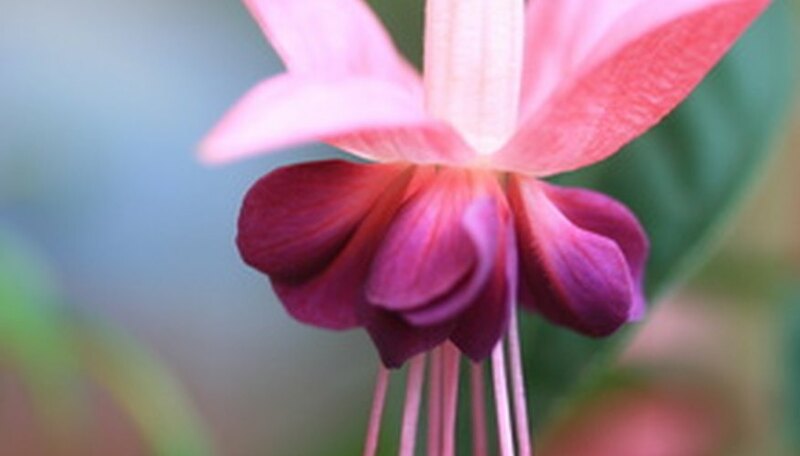 The location should ideally have at least some protection from harsh winds, because some fuschia blossoms are delicate. Water the hanging fuschia plant daily to keep the soil evenly moist. Do not allow the soil to dry between watering and pour the water until it drains out the drainage holes on the bottom of the planting container. Fertilize the fuschia plant once per week by mixing the fertilizer with water according to package recommendations for the size of the hanging basket. Pour the fertilizer carefully over the soil, trying not to allow the fertilizer to contact the plant foliage or blossoms. Remove the seedpods that remain on the ends of the stems after the blossoms fall to the ground. These seedpods will leech energy away from the fuschia plant, which may diminish future blossoming. Remove the seedpods by pinching them off with your fingers. Move your fuschia hanging basket inside in a sunny window if you live in a region with freezing winter weather. Keep the soil moist throughout the winter, but reduce the fertilization schedule if the plant slows down its blossoming and growth. Fertilize a fuschia plant once every four to six weeks during the winter. Place a drainage tray on the bottom of the hanging basket to catch the water as it runs out the drainage holes. This water beneath the basket will help keep the soil hydrated.